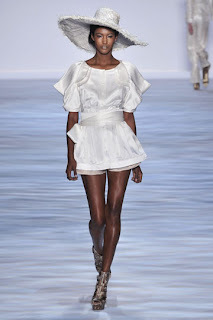 As I was shut out of the Christian Siriano show, for being at capacity, his spring 2010 collection received full applause from those of us who watched the show on-screen in the lobby of the tents. The collection is inspired by the notion of luxurious Mediterranean travel. The palette includes soft khakis, nudes and blushes, infused with rich colors fuchsia, blue and orange, picturesque of yachting in the coastal sunset. Siriano has really stepped up his game for spring, with incredible oceanic and volcanic prints on stunning silk, chiffon and organza. 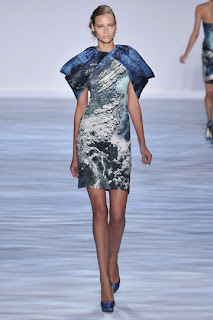 The fabric print was created using an aerial photograph of the intricate Italian coast line that has been flipped, modified, repeated and saturated with Volcanic and Oceanic colors. I especially like the draped sleeve detail seen on the washed silk cotton waist blouse and on the two toned silk dress. 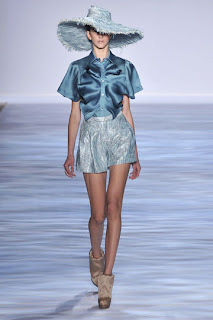 Spring continues with the metallic linens, as seen on the zip front dress in ocean and pleated short. Siriano still shows his dramatic flair, yet focuses on wearable ready-to-wear pieces, like the satin-faced chiffon draped bustier with diagonally draped skirt in volcanic print and a beautiful satin-faced organza draped strapless dress with beaded bodice - the perfect evening dress. 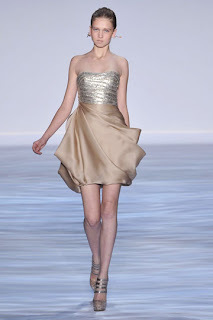 I do love the gowns Siriano presents in the collection. You can definitely see the craftsmanship, skill and work put into them. 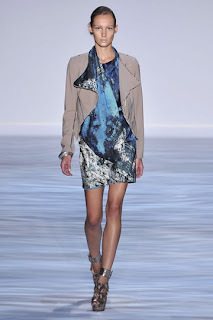 To go along with the spring looks, get ready for the Christian Siriano for Payless shoe collection, also including two of the handbags seen on the runway. The upcoming spring shoe collection marks Siriano’s third line for Payless, this time encompassing textural tribal themes with the use of mottled prints and hides with raw metal sequins and details. The upcoming Payless collection includes To-the-Point pump with upturned point toe and exposed platform sole, It’s-a-Cinch ankle bootie with teeny peep toe, All-Done-Up pump with nickel sequined straps, Cut-it-Out high vamp pump with thick ankle cuff strap and metal sequins, and Stripped Away ankle boot, including a giant zipper that runs all the way up the front of the shoe with a chain tassel zipper pull. The shoes feature Siriano’s signature bull-horn heel in colors that match the runway collection.